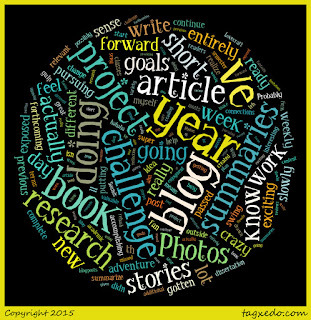 The last three years have been a fantastic adventure in blogging. Taking up the 365-day project such as photo reflections, short stories, and books has gotten me to write a whole lot more than I ever thought I could for my blog. I've passed the 1000th blog post mark and I know this forthcoming year I'll add at least another 150 more! But this year, is going to be a challenge! I've got a book to write, I'm full-swing into my PhD project AND I've got all of these goals to work on. So I'm putting forward a new challenge that I'm not entirely sure I will actually complete, but I feel that I need to continue with this idea of providing myself a yearly focus for this blog, otherwise, it is likely to go the way of the dodo and so many other blogs. However, I'm not crazy. Last year, I didn't really make it in full with my 365 Photo Reflections, so I recognize that I do indeed have limitations and parameters that I need to work within. Yet, I'm a fan of synergy and realize that if I can blog about something that is actually relevant to what I am doing outside the blog, then there is a much stronger chance of me accomplishing my goals. Rather than doing a straight-365 project, this year, I am doing more like a 52-challenge in several areas. I'm returning to short stories because I really enjoyed that project but can't commit to more than one story a week. this year will mostly be H. P. Lovecraft's work as I'm trying to get through all of his works. I've also added book reviews for two days a week and most of these will be received from previous books I've mentioned or taken the time to talk about on this site. I'm not a huge fan of recycled content, but I feel that given the number of new readers I've gotten this year, it might be interesting for people to get exposure to some of my favorite books. I leave Fridays as "Open Subject" which is when I might toss up different types of updates (my monthly reading update, other publications, etc). But the two new features are the Image of the Week and the Article Summary. See, isn't that exciting? Probably not. But I am thinking of using my blog to help me summarize and slowly make sense of the different research that I am doing, both for my classes but also in terms of materials that might be useful for that...gulp...dissertation. But I think the article summaries will actually be a really great project to pursue. The goal of the summaries is to make sure I've made sense of the research and feel I can start to make strong connections across the different research I am exposed to. For readers, it's an opportunity to see where my head is at in any given week and possibly get exposed to interesting research. As for the Image of the Week, it differs from my 365 Photos project in that it will be one image a week and largely, these images will be taken from older publications and such that I have stumbled across in either my research or elsewhere. I'll also only do this once a week but will keep the same format of image, description, and reflection on the image. So that's my goal for 2016--a good mix of content for my awesome readers who have been sticking with me on this journey for way longer than I probably deserve! Thanks for making this a lot of fun! 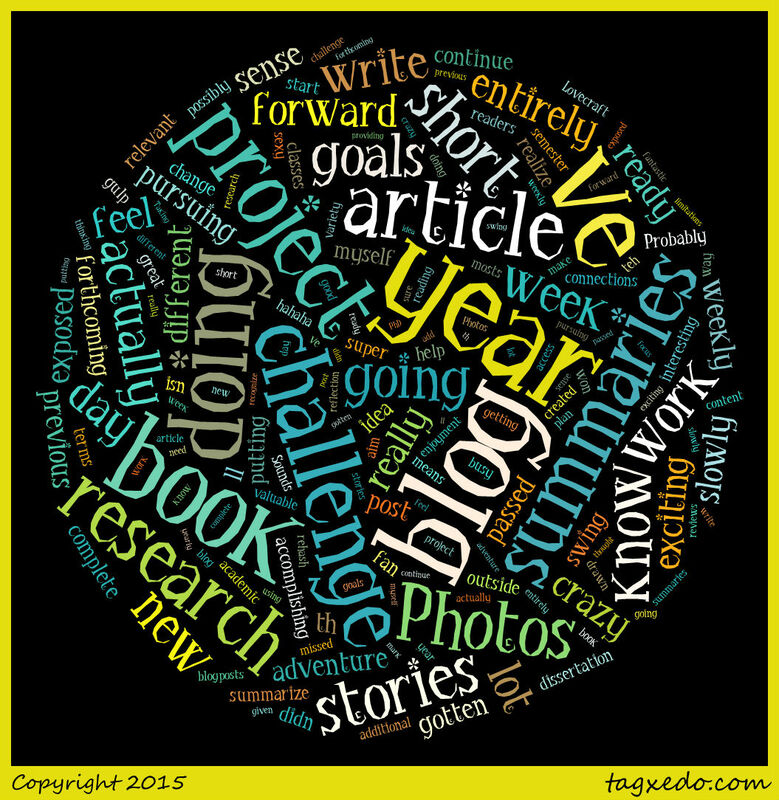 What kind of writing projects are you pursuing this year? Are you blogging? Share you link and let me know if you want to do a link exchange!